Brian Morgan, one of the ARCS Scholarship recipients. He has won the award twice. Brian Morgan (right), a graduate student advised by Associate Professor Reza Ghodssi (ECE/ISR) and based in the MEMS Sensors and Actuators Laboratory, and Daniel Fitzgerald, a graduate student advised by Associate Professor Jeffrey Herrmann (ME/ISR) and Associate Professor Linda Schmidt (ME/ISR), have won 2005-2006 ARCS Scholarships. Morgan also won the scholarship in 2004-2005. Brian's reseach focuses on novel three-dimensional silicon MEMS microfabrication technology with an emphasis on electrostatic actuators. 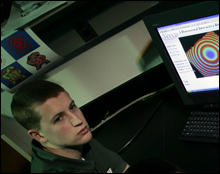 Daniel's research interest is in the area of Design, Risk Assessment, and Manufacturing. Daniel is on the PREMISE team, applying decision production systems to improve environmentally responsible product development. He is currently working with Black and Decker in Towson, MD on implementing a formal Design for Environment process. The awards are sponsored by the Metropolitan Washington Chapter of the ARCS (Achievement Rewards for College Scientists) Foundation, Inc. and will be presented in a ceremony at the National Academy of Sciences on October 6.